Clothing/Jewelry Description An oversized white sweatshirt, red silk pajama pants, white socks and slippers. Medical Conditions Lamanna has been diagnosed with an anxiety disorder which causes panic attacks and sometimes makes her agitated and paranoid. She was hospitalized briefly on the day of her disappearance as the result of her condition. It's possible she suffers from amnesia and doesn't recall her identity or how to get home. Distinguishing Characteristics Caucasian female. Dark brown hair, brown eyes. Lamanna has a widow's peak on her forehead, and she has a keloid scar on one of her inner elbows. She converted to the Muslim faith prior to her 1994 disappearance, and she does not drink alcohol or use drugs as per her religious beliefs. She also maintained a vegan diet in 1994. Some agencies may spell her last name "LaManna." Lamanna may use the names Darleen Hansen, Darleen Hartsfield, Darleen Hatfield, Renee Leman and/or Jean Smith. She speaks French, Arabic, Portuguese and Farsi as well as English. Lamanna resided in Fresh Meadows, New York in 1994, and was studying nuclear medicine technology. She was found walking the streets of the New York City borough of Queens in an incoherent state on January 8, 1994 and was taken to Queens Center Psychiatric Hospital for a psychiatric evaluation. Lamanna was taken to her sister's home in the 2500 block of Wesley Avenue in Ocean City, New Jersey after her discharge later that day, and they had dinner. She suddenly ran from the house at approximately 7:00 p.m. that evening. She was carrying her navy blue bathrobe with her at the time. The outside temperature was below freezing. Lamanna was last seen inside the Waterfront Bar in Somers Point, New Jersey at approximately 9:00 p.m. She has never been heard from again. Her bathrobe was discovered two blocks from the establishment shortly afterwards. A sheriff's department bloodhound traced Lamanna's scent between two homes on Central Avenue in Ocean City, but there was no other evidence of her at the scene. She may have hitchhiked out of the area. There were sightings of Lamanna in New Jersey in May 1995 and in New York in December 1995. Between 2014 and 2016 there were reported sightings of a woman resembling Lamanna in Virginia and North Carolina; she was hitchhiking, had maps of several different states and told people she was looking for her family. 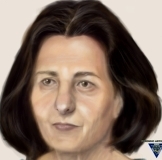 The woman was located in Florida in January 2016; she was not Lamanna. According to Lamanna's sister, she graduated from the University of Scranton and volunteered with the Peace Corps in Morocco. She dated an Afghan immigrant taxi driver for ten years and her mental breakdown the day of her disappearance was precipitated by the end of that relationship. Her sister stated Lamanna was suffering from anorexia as well as anxiety at the time. Some agencies state that Lamanna vanished from Ocean City, New Jersey. Updated 11 times since October 12, 2004. Last updated March 17, 2019; four pictures added.